With bubble tea popularity reaching an all-time high in Vancouver, it was quite refreshing to see something other than an international chain expansion open in Vancouver. Buns + Boba, a local operation that sources all bubble tea ingredients from within Canada, is making a name for itself through its small-batch menu items and the small home goods available for purchase. 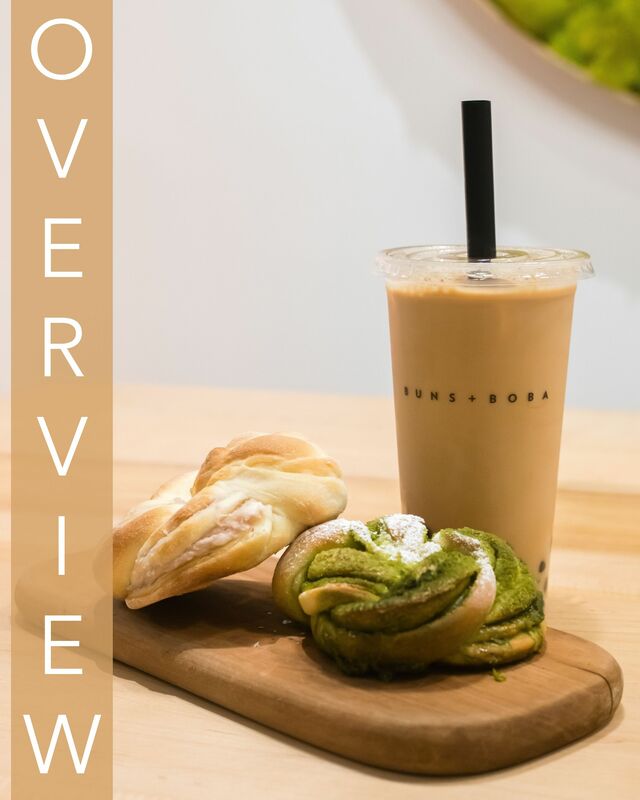 I had a chance last week to "break boba" (that's a play on "break bread" there) with one of the co-founders and learn about the Buns + Boba experience. I've listed the buns in ascending order of favouritism. Not to say any buns were terribly bad, but if someone put a gun to my head and told me to order them, I'd put the lemon curd bun as my 4th favourite because I personally didn't find much appeal in a sour zing in a fistful of doughy bun. The matcha bun was my 3rd favourite bun. I'm a connoisseur of all things matcha but believe some might find the small sugar crystals embedded within the matcha paste to be a strange mix with the doughy bun. This would be best for matcha fans who need a bitter treat to pair with a sweeter drink. The cinnamon bun was a fresh take on a very saturated market. As much as I love Grounds for Coffee, whenever I see a cafe that's been supplied by them, I can only be so excited to try a brand I like at another satellite location. The cinnamon bun at Buns + Boba had just the right amount of icing and cinnamon sugar texture to go along with the fresh bun. Like any good cinnamon roll, the swirls were real in this bun and I could eat one of these any day of the week. Number one bun for me was hands down the taro bun. My most recent exposure to taro has been through bubble tea, but let me tell you about the joy of taro in a bun. At least in the Buns + Boba version, the taro weaves an elegant pattern through the bun, filling in the crevices left by the baked folds of the bun. I thought it best to represent this in a top-down photo. Taste-wise, this had a taro flavour profile, which for the uninitiated, tends to mean a blend of nutty vanilla and potato mixed together. If you've never experienced this tropical flavour, the taro bun at Buns + Boba has my vote of confidence. Moving on to the drinks, the B&B milk tea was up first. The real moniker here is "Buns + Boba" Milk Tea, making this the namesake drink of the establishment. The story behind this drink is Hong Kong cafe meets bubble tea. The simple combination of evaporated milk with the housemade pearls produces a milk tea drink that tickles the sweet tooth (though you can customize the sweetness) and makes it feel like you're in a much louder (read: HK cafe) environment. If you really want to get into history, drinking HK-style milk tea is a throwback to British colonial rule over Hong Kong which combined afternoon tea with Hong Kong cafe fare. You won't find a drink like this at the usual Taiwanese chains. Following the trend of 2018, Buns + Boba also offers its version of brown sugar milk tea. Tea is a staple in this drink though it's of a lower concentration than something like the B&B milk tea. The pearls, by the way, are of a chewier variety at Buns + Boba. If I had to compare something relative, I go to Shiny Tea pretty often and find those pearls to be slightly mushier. Pearl chewiness is really subjective, but I enjoyed the pearls at Buns + Boba. If you have a weak jaw, you'll want to ask for softer pearls. The brown sugar milk tea is a fun drink to have with a little more sweetness than the average drink on the menu. The roasted brown sugar adds some pretty intense flavour to the mix so you'll be in for a ride. Again, sweetness can be customized to your liking. Buns + Boba is a cute little cafe in Vancouver's Mount Pleasant neighbourhood. In addition to being a bakery and bubble tea shop, it's a coffee shop and home goods shop. One co-founder (a born Vancouverite) described to me the experience as a craft bubble tea experience. In addition to sourcing all teas from Canada, the ingredients are prepared in small batches (they can literally bake only 8 buns at a time) so as to promote freshness and aroma. Every bun smelled great out of the gate. Another great thing: zero preservatives and concentrates are used to produce the menu. There is seating for about 30 guests among a long table, some smaller 2-seaters along the wall, and another seating area in the back. It's a nice mix of seating when you compare it to the usual bubble tea shops which are usually a dominant counter space and maybe like 10 chairs (looking at you, Xing Fu Tang). It's also still Christmas in January here. Not a big deal to me. Putting up decorations is hard work and I'll milk that Christmas feeling for as long as I can. For a sweetness quote, the 75% sweetness drink option here would equate to 25% at the chains. For that reason, if you need some serious sweetness, there's a secret 150% sweetness you can opt for to up the sugar ante as you place your order. As for the name Buns + Boba, the "boba", rather than a play on the American slang of bubble tea, is a play on the Chinese translation of bubble tea, "波霸奶茶", which is read as "bōbà nǎichá".